It's that time of the month-halfway! :) And so my friends at Creative with Stamps, and I are ready to share some mid-month inspiration with you. This month it's about including a sentiment on your card. This was super fun to make. I stamped and colored the girl monsters. I used black embossing powder for 2 of them and pink ink with clear embossing powder for the middle monster. The black background paper is from Pebbles and the orange was a scrap. The monster stamps and sentiment are all from Craft Smart (Michaels 2012). They are colored with Copics. The spider web is a Martha Steward web punch. I used glittery cardstock for it. Lastly, the rhinestones are from Michaels. Please make sure to include this graphic on your posts. Be sure to visit the other DT ladies as well. Retro Rubber Challenge Blog-Halloween *I bought these stamps in 2012 from Michaels. This is soooooooooooo fun! I loveeeeeeeeeeee it!!!!!!!!!!!!!!!!!!! Cute card and fun images. Adorable card!! LOVE the sentiment!! 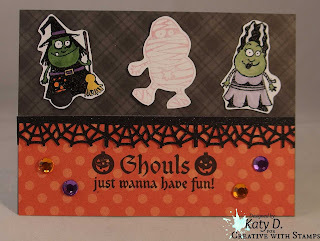 Adorable Halloween card, Katy! You have some mad coloring skills! Love the colors and papers... This bright and fun card brought an instant smile to my face. Thanks so much for sharing it with Retro Rubber this week. Hope to see you play often with us! Your little monsters are adorable and the sentiment gave me a good laugh! Love yours coloring!! Thank you for playing along with Retro Rubber and hope you will join us again soon. What a cute card! Your monsters are adorable! And I have that sentiment stamp! And I have yet to use it - but it fits perfect with your monsters! Thanks for joining us at Retro Rubber! Fun card, love the layout. Thanks for playing along with Retro Rubber.